Not only is it not uncommon for autistic children to be particularly picky-eaters, I would have to say that it is actually the norm. If you only have experience raising autistic children, let me tell you that this is not specific to this disorder. Everything in this article should just as easily be applied to children without any mental disorders. My number one piece of advice for you when your autistic child is having issues eating certain foods is consistency. Do not let your children get away with misbehaving or refusing to eat at a young age or you will have difficulties throughout their childhood, or for an autistic individual, perhaps the rest of their life. Do not give in or give up! Something that will help tremendously is to make sure you eat dinner together as a family. When I was working in the institution we called this “family style eating”. It is important to sit as a family, eat together, and have conversation. Try your best to include your child in the conversation and allow them to eat with independence. It is understood, though, that it may certainly be necessary to assist them to eat. Giving your child choices during or before his meal may also help him be more comfortable while eating and could ultimately reduce behaviors. Having some feeling of control in their own lives is very important to some individuals, even at a young age. No matter the choices, make sure that your child has a balanced meal. What if there is absolutely no way to get my child to eat some things? Unfortunately, with all of the prodding and coaxing in the world it may not be possible to convince our autistic children to eat some foods. In this area I would strongly recommend experimentation. There is a truly limitless variance of food in the world, and you can benefit by trying new things. If your child won’t eat a typical salad, then try a broccoli salad. If your child won’t eat some meats, then try feeding them salmon. We are a fisherman household and I have come across a number of delicious ways to cook up fish. I will not tease you with the thought of a well-cooked salmon, I will be sure to share these recipes with you. Even when experimenting with new foods, do not give up just because your child refused one time. Try to reinforce your child with treats like M&Ms or some other food that they like. 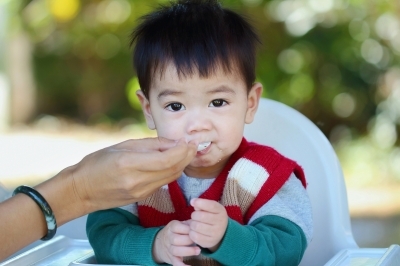 After my child was gagging all the time and vomiting up his foods, I started to make sure that he received smaller bites of food and then I treated him and eventually feeding him became easier. Some recommendations for parents with picky autistic children are: chopped, moist foods like mashed potatoes, moist ham, fresh fish, and broccoli salad. Also, frozen peas can be given to your child as a treat believe it or not. This is because when they are small and in a bowl and your child can eat them with their hands it seems more fun, and because they are frozen they don’t associate the taste with something gross. No matter what you are trying to do to get your child to broaden their horizon in the dining room, always be sure to give your child a lot of praise and eat with them as a family so that they can feel like they are growing up just like their older brother or sister.